these are powerful words. i remember the day these words rang out in front of my eyes; and the vibrations of the ring have never stopped. i was sitting on an airplane waiting for it to take off. i pulled out one of the magazines in the seat pocket and was thumbing through it. this magazine had several 'motivational posters' it was selling. 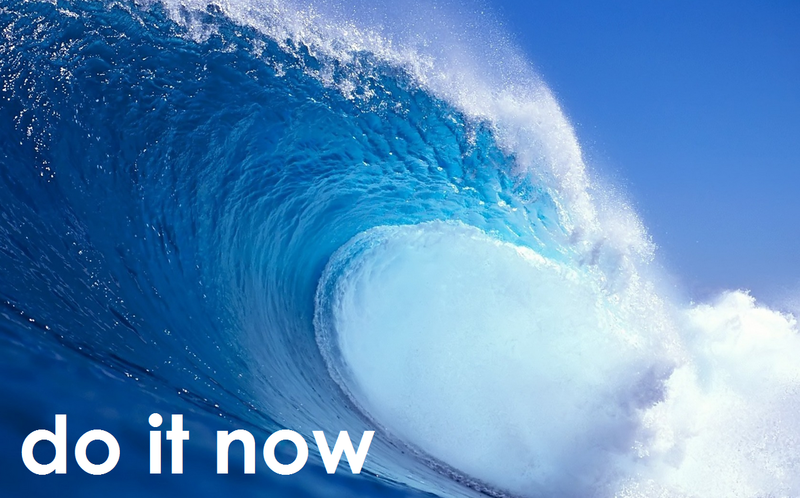 one of them was a picture of a big blue ocean wave with the words 'do it now' underneath. i was so impressed, i took the magazine, cut the picture out and had it laminated. i kept it with me for several years before losing it in a move. while searching for that picture, i came across another quote. this one is attributed to paulo coelho, who wrote the alchemist. the quote was: "one day you will wake up and there won't be any more time to do the things you've always wanted. do it now." it is sound advice; especially when you are a person drowning in debt, clutter and a sedentary life. the character andy dufresne, in the shawshank redemption said it best, when he was faced with seemingly insurmountable odds: "get busy living, or get busy dying." indeed there are barriers which prevent us from getting things done. however, almost all of these are psychological. the way you get over those barriers is to simply do it now. just get out the door. just start on it. just start cleaning up that clutter. just dump that un-needed stuff in a bag. just make the choice to do it. once you have that little momentum going, the magic happens and you begin to feel really good.